Do you think your family is dysfunctional? Do you have crazy siblings, parents or relatives? Do you feel sad, thinking that other people have normal families, especially during the holidays? I want to set the record straight. Heirloom Meals is not about perfect. It’s about memories and food and how those memories connect us to our past and are a bridge to our future. And how our food memories have shaped us. Family is my true north but it is by no means perfect. In fact, my family has ugly warts everywhere. And believe me you, I have fantasized about having a Donna Reed family - one that joyfully gathers, plays touch football at Thanksgiving, and is fully functional, communicative, non-judgemental and loving. Hollywood and Madison Avenue have penetrated my psyche. They sell a perfect version of perfection. Many of us (me) have used this perfection standard as a role model from which to measure our families. I am guilty of wishing I belonged to a different family at times. 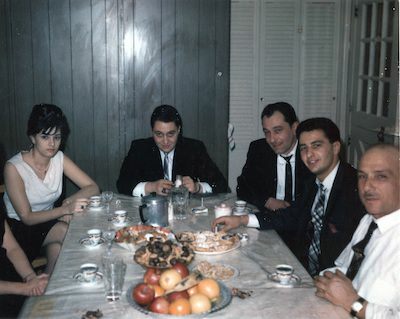 Afterall, I grew up in a three-generation Italian-American household with the extended family that looked like it was out of central casting for the Sopranos. Growing up in Pelham, NY which at the time was predominantly WASP and Irish Catholic, I longed for what I imagined my friends were experiencing. Perhaps that football game. Or even roast beef with yorkshire pudding. Fortunately we grow up. And we develop the perspective to appreciate and love all the things that were cringe-worthy as kids. I believe all families are quirky and deal with drama in one form or another, have screwball relatives, and experience bad behavior. Let’s get over it already! With all their flaws, odd habits, political biases, quirky behaviours - they are my family. Part of my unique fabric. I don’t even like some of them. But there is something in me - a deep-seated love, a common bond, DNA - whatever - that calls me home to that familiar dysfunction - to the faces that carry vestiges of my ancestors, to the beings who I shared most of my meals with for the first 18 years of my life. There among the chaos is a sort of peace, a comfort. An unspoken truth. My roots. As I excavated the recipes and memories of family meals and recipes, I began to understand who I am, where I came from and gained a deeper sense of belonging. So my plan is to show up at family holidays with love and joy in my heart, accept the behaviours that I cannot change, and not crave Donna Reed’s family. That’s my goal. I will bring joy, not judgement. And honor everyone’s warts! May you too find a way to love and cherish your perfectly imperfect family. PS If you want to excavate those family recipes and discover how the process of connecting to your past really heals you, please consider joining the next Heirloom Meals Recipe Project Workshop. Memories are tiggered when you least expect them. Saturday night we were invited to join some friends for a Christmas Carol sing-along. Admittedly, even though I said yes, I was on the fence. We arrived to a postcard scene of merry singers - decked out in Santa hats and other such festive-wear. Some held LED-lit candles or even real candles. I immediately let go of my resistence to enjoy this and began to sing. Guess what? Singing brought me joy. Plain and Simple. Then, in a flash I was transported to Pelham Manor, NY, circa 1975. I was having a "Come Carol with Carole" party. I hadn’t thought about those parties in a very long time; but I recalled, in that instant on Saturday night, how much I love Christmas, love to sing, and love to spread joy and happiness. 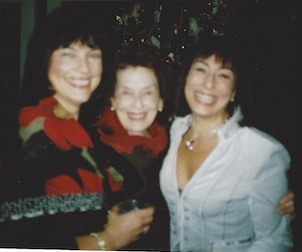 The party was simple: Mom and I invited friends to join me while we spread Christmas cheer around the neighborhood. We rang people's doorbells (and people were not afraid to open the door) and began to sing. I remember being giddy and skipping down the street, arm in arm with my pals. So full of joy. When we were done, we convened at our house for homemade pizza and desserts. 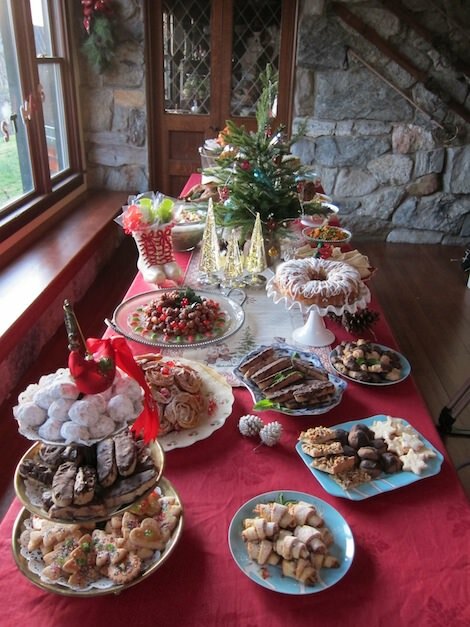 I see so clearly how the table was set, how my friends’ cheeks were rosy and healthy, and how we all devoured the Christmas cookies and hot chocolate. What could be better than cookies and carols? With a song in your heart and cookies in your belly, I invite you to spread the joy of the season. And from me to you, my favorite cookie recipes from the heart of my family recipe box. PS If this story resonates with you...I would love to take you on the journey of tapping into your food memories. The Heirloom Meals Recipe Project is designed to bring you back to the spirit, essence, and love that came out of the kitchen of your family, from yesterday through present day. I know I have been a bit silent over these last few months. If I told you I have experienced the gamut of emotions, would you believe me? Well, of course you believe me. Why would I pose the question? So here’s how I have been rolling…. I spent the first 2 weeks of May at a writers residency program on Martha’s Vineyard. I decided to write a food memoir. Yes. All about ME! It is quite a journey going back in time and recalling scenes of your life. It is very healing and very powerful. I cannot wait to share it with you. Of course it’s a memoir with recipes!! Hanging over me and our family during the spring and early summer was the knowledge that my dear sweet sister-out-law had stage 4 breast cancer. While I prayed my heart out, held onto OPTIMISM like it was the last ticket out of town, I knew it wasn’t good. We hosted a magical family reunion late May for Madeline. She was radiant, happy, and beautiful. I thought I was witnessing a miracle – that she had turned the corner. The truth of the matter is I was witnessing a miracle. It’s called living every moment. Or bringing the people you love together to share our love for each other. Or providing the space for lasting memories. Five weeks later. Madeline passed away. I carried her pain in my body. I sobbed. I walked around like a zombie. I tried to comfort Jim. And then mustered up the energy to have another family reunion. An old-fashioned Irish wake with the casket right here in our home. It was an honor to offer Madeline one last night at Boulderwood. Her send off was beautiful. It was pure, unadulterated love. Love that emanated from Jim’s heart, my heart and all who loved Madeline. The priest’s eulogy was powerful. He said God is in all of us. I believe that. We meet people that give us what we need at the moment we need it. This is how God works. This is how the universe works. It has been said that because so much of our lives today are documented in technology that we chance to loose our history and stories in these devices. Carole Murko has offered a gift of leading us through the writing of our families’ food history and memories so that they are not lost and can be passed down for generations to come. She takes you on a beautiful, emotional, supportive and loved filled journey that is a gift unto itself. With her warm and creative guidance you create together a memoir that you never realized was inside of you waiting to be shared with those you love. This is a gift to give to yourself, to a friend, to family. Everyone should experience this journey with Carole Murko. Thank you Debby for that! Your words went right to my heart. Please check out the class. I would love to have you among us! When I talk about Jim, I have referred to him as my husband. Well, because he is my spiritual soul-mate and common-law husband. But truth be told, we are not married. On August 4th, my birthday, he asked me to marry him. I. AM. ENGAGED. WAHOOOOOOO!!!!!!!!!!!!!! I am like a little girl. Giddy. Elated. Thrilled. I have always wanted to be married. It was part of my little girl and twenty-something dream. Jim’s commitment to me has validated and honored me. I felt an energy shift in my body – at the cellular level. And in perfect heirloom meals style, he gave me his mother’s engagement ring. I will treasure it forever. It is so much more meaningful than some huge showy diamond. I always said that when I found the right man, a Cracker Jack box ring would do. For whatever reason, this is the time and place in my life I am meant to be married. I get to plan a wedding my way! My parents get to see me marry the love of my life. It is perfect timing. I will be sharing the wedding journey from designing my own dress to figuring out how to do all the food and be a relaxed and rested bride!! EXCITING!!! I am blessed. To have a life so full. Thank you all for being part of it!! 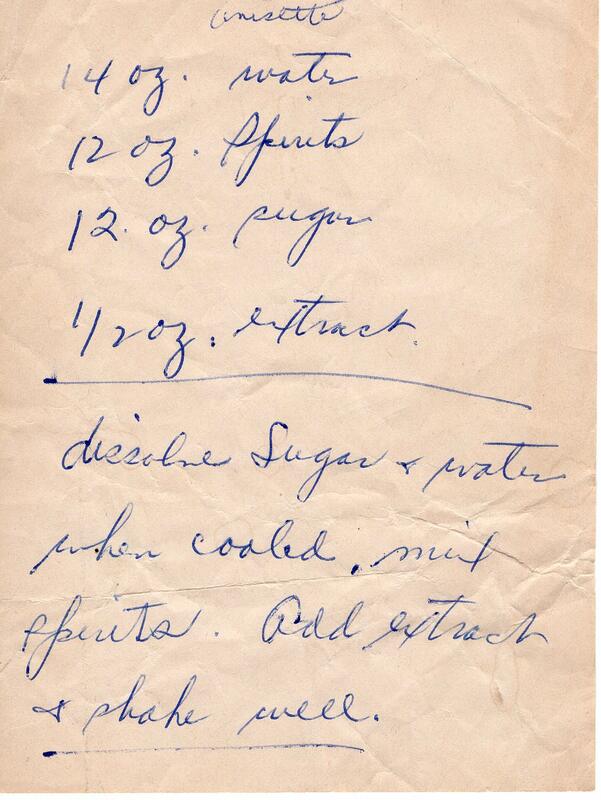 PS No post is complete without a recipe. I am hanging onto summer with dear life. Here’s my signature summer salad recipe! 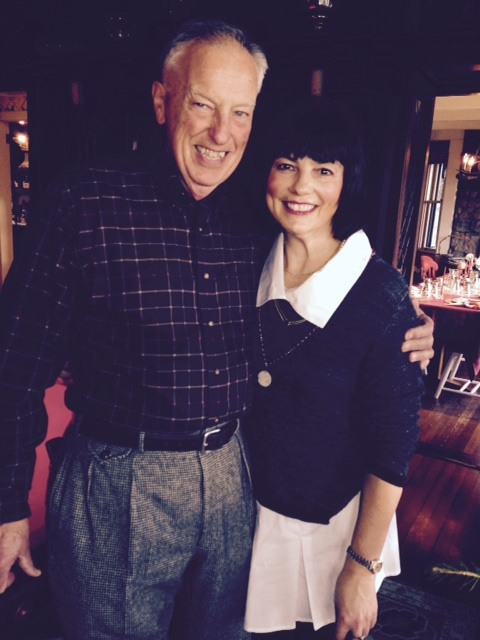 As many of you know, I just hosted a magical writing workshop with the amazing Nancy Aronie. Truth be told, it's a few weeks later and I am still beaming from the experience. A group of 14, thirteen women and one man, gathered together as strangers, but left forever in love, having shared deep and oft-hidden morsels of our souls. I was told it is universal. I would love your comments. Much love to everyone! The hardest thing is watching my parents age. What is it about life that tricks us into thinking we stand still? That we, ourselves, are not aging. I carry around pieces of so many of my own stories. Sometimes I am the 15-year old full of innocence, other times I am the beat up career warrior with lawsuit scars, back stab wounds, and self-doubt. Then I am fat, skinny, beautiful, ugly, loved, hated, adored, gregarious, and shy. 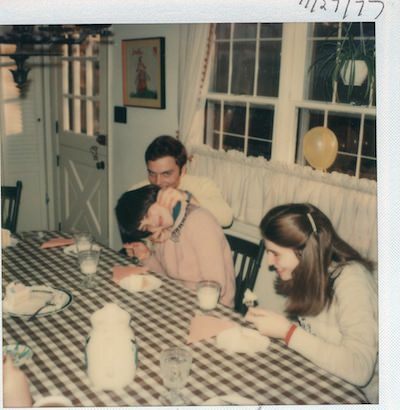 I am my parents – tangled up in their stories. Their parts are my parts. It’s like from the time we are born, we are working on combing out the dreadlocks of connections – to find our own way, yet remain an integral part of theirs. Sometimes the comb gets stuck in a nasty knot of confusions and sadness – a mess. Then, like magic the comb slips through the now silky locks. My parents have always been my true north. They have given me so much and, I guess, I received it. I welcomed their advice. I studied their warts. I fought to be my own compass. And now, as I see them become vulnerable to the ravages of time, I get sad. Where will I be when they are gone? Have I done my job of honoring them and myself, equally, so that when the time comes, I am whole, and they are not a tangled mess of memories but a beautiful part of my forever fabric of being. Sometimes life delivers you a pause. And generally, it is because that is exactly what you needed.